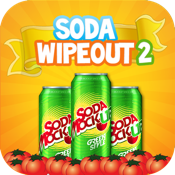 Soda Wipeout is based on a traditional game played by people from the Far East. The challenge is to clear all soft drink cans stacked on top of each other in unique formation. A player is given tomatoes in an attempt to clear the formation. It is a big challenge trying to clear all. As the game progresses, the subsequent levels are presented with more and more cans to be cleared. It is a very challenging game with special sound effects.